A well-targeted campaign and a well-tested message can only get you so far – you need sharp paid media that breaks through the din of election-season crap. Signified campaigns begin with a media plan built around our target audience and end with accessible communications coordinated across relevant channels. We keep everybody on their toes. For our 2016 pre-roll and TV highlights, click here. For a gallery of our favorite 2016 direct mail, click here. For a gallery of our favorite websites of the last couple years, click here. Big oil put more than $2 million behind “Chevron Cheryl,” an incumbent Democrat and their bulwark in the legislature. 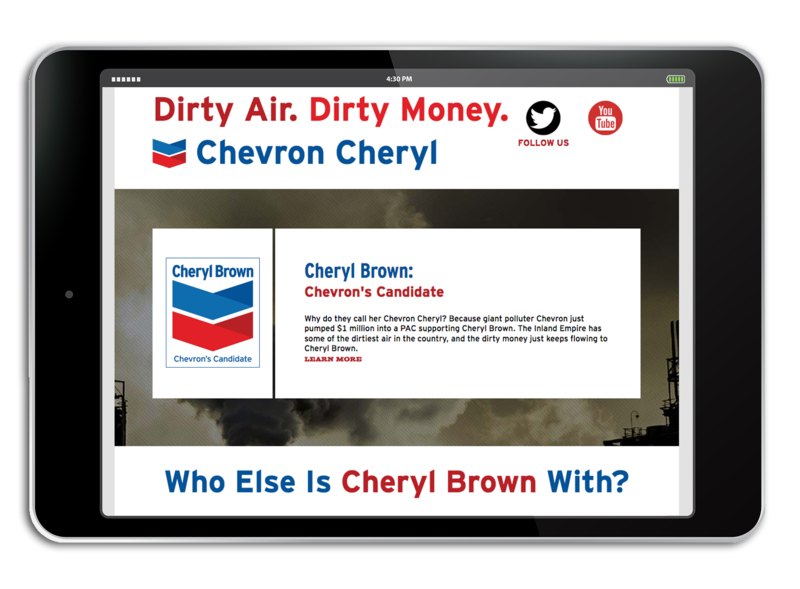 Signified joined an all-star IE committee with great mail and field firms to add targeted digital and an earned-media-boosting mobile billboard to drive the narrative at all of Chevron Cheryl’s public appearances (giving us endless messaging opportunities and her endless fits). We went from a distant second place in the top-two primary to a commanding 10-point win in November.